Are you a welder or a DIYer that loves playing with fire? You know what that involves – sparks flying all over the place, open flames and lots of heat. How else can you protect your feet, other than buying the best welding boots on the market? These boots have a specific design and use certain materials that are specifically intended for welders. As such, they’ll keep you safe from all the hazards involved in welding. They are very protective and comfortable, you just need to know what to look for. 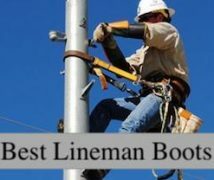 That’s why I’ll start this article with a comprehensive buying guide that analyzes the most important features of welding boots. After that, I’ll move on to some of the top welding boots available today, so you can make an informed purchase. But before that, If you’re in a hurry, here are the products that we are going to analyze in this article. Further down you can read the full welding boots reviews. Since you’re after a good pair of welding boots, you need something that protects you against electrical hazards, sparks and heat. So with that in mind, composite toe caps are the best for the job, not to mention that they’re very light. That’s because composite is a non-metallic material and it doesn’t conduct electricity and heat. However, steel or alloy toe reinforcements are also a valid choice if they have an Electrical Hazard rating, even if these toe caps are made from metal. The reason is that steel and alloy offer increased protection against impacts and compression, which is really important if you’re working on a tough yard. Welders need to stay safe from sparks and heat, so a metatarsal shield is essential. However, make sure it’s a quality shield, made from sturdy materials that are resistant to heat and open flames. 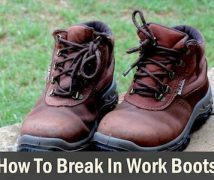 But it’s also important that it resists to constant wear and tear, particularly if your line of work is tough. Make sure to check how it’s secured too; you wouldn’t want to catch all sorts of stuff. There are different types of welts, but the most resistant one is the Goodyear welt because it has more layers of stitching. It also can easily be repaired, although it’s less flexible. However, a direct-attach construction works great with the rubber soles that most welding boots have, and it’s also really flexible. That helps a lot if you’re constantly squatting. However, this sort of welt isn’t as tough or durable as the Goodyear welt, though it can perform quite well. Still, the most important thing to look for when it comes to the welt is how resistant that is against flames and sparks. With that said, flexibility comes at a close second place. In regards to the materials used, make sure you get resistant, sturdy boots. The leather is the most commonly used for the uppers, but there are different types of leather, with the cheapest ones being the easiest to scratch and puncture. The outsoles are usually made from rubber, which provides great traction and performs well in heat-exposed environments. However, rubber is a bit heavy, so you can choose a synthetic material for your boots. But usually, synthetic materials don’t perform so well against heat and they also don’t offer exquisite cold-weather traction. If you’re working long hours every day, you need a cushiony insole too, while an anti-microbial lining is the best to protect you from smelly feet. You should also opt for moisture-wicking linings if you’re exposed to high temperatures, which is common for welders. There are different things to take into account in regards to the design, like how easy it is to kneel with the metatarsal guard. Choosing between zippers and laces is another thing to take into account because laces might provide increased support, but zippers are faster to close and open. On the other hand, zippers might easily get stuck or break right before you have to leave for work. I like anatomical designs in terms of comfort, which is especially important for people working long hours on their feet. As such, look for asymmetrical toes and ergonomic footbeds that mimic the shape of your feet. It’s also a great idea to opt for more supportive shanks if you work for prolonged hours. Besides, if you’re interested in support, make sure you get a padded collar and a high shaft, at least ankle-high if not taller. I like higher heels and higher platforms because they round up a design that’s altogether more robust. If you have a lower budget you might think that you can’t choose a reputable brand to buy your welding boots from, but you’d be wrong. Nowadays, many reliable brands manufacture and retail durable, high-quality boots even at a lower price range, so you don’t have to sacrifice quality for the money. On the other hand, it’s true that more expensive boots offer some additional advantages on top of the basic features. For instance, you might expect to see more resistant materials, as well as a more ergonomic design. Now that you’re here, you know what the basic characteristics of welding boots are, so you know what to bear in mind when it comes to choosing the perfect pair. We’ll help you out by discussing the items below in terms of their best use, as well as their pros and cons so you can make an informed purchase. With a grade-A construction, these Timberland boots are definitely a boot for welders who want to have top-notch comfort and protection. They are very dependable and durable, which can easily be explained by the quality materials used for their construction, some of which are trademarked. For instance, the EverGuard ™ leather used for the uppers is highly protective against all abrasions and punctures, while the insoles are anatomically contoured to provide the utmost support to your arches. I like the very supportive and cushiony footbeds, made from a closed-cell polyurethane, to avoid feet fatigue. The hinged Met Shield is also quite a feat, especially when you’re squatting, and the asymmetric shield design is truly ergonomic, following the anatomic shape of your feet. And I can’t skip the PRO™ 24/7 integral steel shank, that’s really durable, as well as incredibly supportive. The PRO™ rubber outsole is slip resistant, complete with the best electrical hazard protection, while the ThreadKevlar™ sewing thread used for the welt is resistant to flames. Speaking of which, you’ll get a Goodyear Welt that’s the most resistant type of welt, and the steel toe comes with an ASTM F2413-05 M I/75 C/75 Electrical Hazard rating. So what could possibly be the downsides to these seemingly perfect boots? Well, I can start with the fact that they’re a bit bulky and heavy, which can also be explained by the materials used for their manufacturing. Besides, they need some breaking in time, so make sure you wear some comfy socks while you do that. These Harley-Davidson welding boots offer a sturdy, reliable construction. The full-grain leather uppers are very durable and protective, and I like their rubber soles for the perfect traction offered. In fact, the soles are resistant to both oil and slips. I like the direct attach construction which fits well with these rubber soles, but it’s not as resistant as the Goodyear Welt of the Timberlands. The whole design looks and feels very durable, starting with a supportive 6.5-inch shaft, a reliable 0.75-inch platform, and a comfortable, 1.5-inch heel. Besides, the cushion sock lining is full-length, providing you with some extra comfort and support, to avoid feet fatigue. However, the insoles are completely out of whack when it comes to comfort, you probably need to replace them with something more cushiony. The right and left toe caps contribute to that reduced feet fatigue too, considering they’re individually fitted, so they follow the anatomic shape of your feet. Besides, these steel toes come with the great ASTM F2413-11 M I/75 C/75 EH rating for maximum protection. Still, the locking inside zippers aren’t that great, they’re prone to tears if you don’t handle them with care. The Ironbridge are as tough as their name suggests. Their black full-grain leather uppers are really resistant, and so is the Dr. Martens trademarked stitching that’s water-resistant, flexible and durable. Besides, the leather used for the uppers is the industrial sort, and it’s not processed, so it’s also flexible, not just resistant. I love that these boots are waterproof, as well as easy maintenance, which is an important quality. The padded footbeds are another great feat, in terms of cushioning, while the Cosmo inner lining prevents sweaty feet since it’s moisture-wicking. I also really love the non-marking, polyvinyl chloride outsoles that are shock-absorbing to reduce feet fatigue. So although the soles aren’t made from rubber, they’re still durable, resistant to impacts and offer good traction because they’re heat-sealed. Plus, they’re lighter than rubber. These boots are resistant to all sorts of stuff, like oil, chemical corrosion, electrical hazards and impacts, thanks to their steel toes and met guards. I also appreciate the support provided by the Smartmask insoles, the wood shanks, as well as the mesh padded collar, so these boots are comfortable as well as tough. So what are the downsides to these boots? To start with, the PVC outsoles aren’t that great for high temperatures, and they’re also not great for cold weather traction. Besides, these boots need some breaking in time, and you also have to be careful about catching on things with the metatarsal guards. These Caterpillar boots are definitely amongst the top dogs. With their leather uppers that are resistant to punctures and scratches, they feature some very sturdy metatarsal guards that keep flames away from your feet. With rubber soles that provide amazing traction and slip-resistance, these ankle-high boots are really supportive. The laces are easy to tie and resistant, they don’t tear easily and so you won’t have to replace them on a constant basis. I also love the padded collar in terms of ankle support but just know that the insoles are really thin, so you might need new ones. Otherwise, these boots have steel toe caps, so they’re resistant to impacts and compression, as well as electrical hazards. Besides, the high platform and sturdy heel are great on uneven terrain and for long hours standing. Still, these boots run a bit small, so take that into account as well before making your purchase. If you’re looking for a pair of good welding boots at an affordable price, the Rhino Men’s have some features that put them on par with the more expensive boots on the market. For instance, their Goodyear welt comes as a nice surprise, considering it’s the most resistant type of welt on the market. Another very surprising quality is how cushiony they are, probably even more so than other more expensive boots, like the Harley-Davidsons or even the above-reviewed Caterpillars. So you won’t have to worry about changing the insoles with these great boots. Even the padded collar and tongue are very nice in terms of support and cushioning for your ankles. I also love that they feature an external metatarsal and a resistant steel toe with an ASTM F2413-05 I/75 C/75 EH rating for amazing on-field protection. The soles are made from a natural rubber, and they’re resistant to both oil and slips, so traction is the least of your concerns with these boots. These boots are made of leather, but the type of leather used isn’t as resistant as that used for pricier boots, so you can scratch it easily. 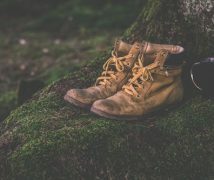 You should also know that these boots are pretty stiff in the first few days of use, and you need better laces if you’re going to wear them on a constant basis. We’re cyclically ending our welding boots reviews with another great pair courtesy of Timberland Pro. Although they have a more expensive retail price, they have many of the same characteristics we’ve seen with the first Timberland boots. For instance, the highly protective steel toe and metatarsal guards that don’t catch easily on things are great assets. But there are the trademarked features we’ve seen before too, which really make the difference, like the super-resistant Ever-Guard™ leather used for the uppers, the Kevlar™ sewing thread that’s resistant to heat and fire, and the traction master PRO™ rubber outsoles. I love the cushiony closed-cell polyurethane footbed that aims to reduce foot fatigue along with the Toe Rand contour and the FlexShield design. I really like that these boots are waterproof, and their anti-microbial lining fights nasty odors, but also wick moisture so your feet aren’t affected by sweat in any way. However, they run somewhat small. Still, there are some differences when you compare these boots to the previous Timberlands, like the fact that these have higher, 8-inch toe shafts, so they provide better ankle support. Besides, they’re lighter, although they feel a bit stiff at first too. We’ve taken you through a series of best boots for welders, and we hope you found the right pair for you, especially after reading our initial buying guide. We have a pair for every budget, and as you can see, each has its own particularities. So with that in mind, which pair of boots you like the most? Does your work involve anything else apart from welding? What work boots for welding have you tried by now? Leave us a comment below!